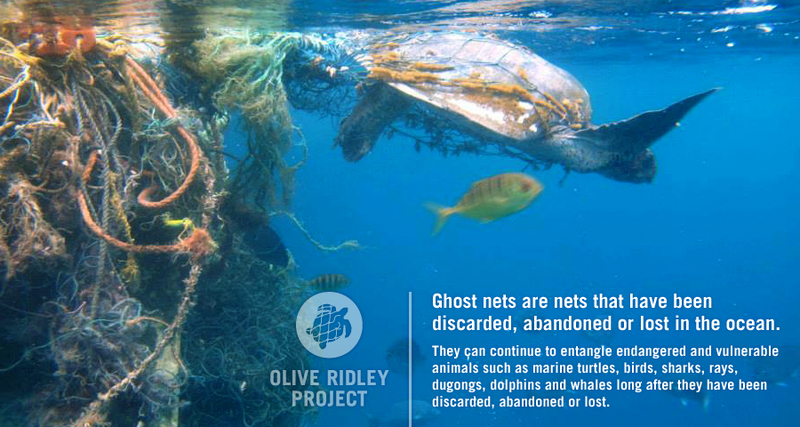 Ghost nets are fishing nets that have been discarded, abandoned or lost in the ocean, and are a major threat to sea creatures. Sometimes these nets will wash ashore but other times they are carried on ocean currents far from their place of origin, trapping and entangling anything in their path, including sea turtles. This is where the Olive Ridley Project (ORP) steps in. Created in July 2013 by marine biologists Martin Stelfox and David Balson, the Olive Ridley Project started as an initiative to target ghost nets in the Indian Ocean. The project consists of four elements to tackle ghost nets: research, awareness, removal and recycling. Stelfox and Balson both work in the Maldives and were encountering a large number of olive ridley sea turtles entangled in ghost nets. Olive ridleys get their name from the coloring of their heart-shaped shell, which starts out gray but becomes olive green once the turtles are adults. This species is particularly rare in the Maldives. High nesting populations are found close by in Orissa, India, and statistics suggest that 80% of the world’s nesting takes place here. The Maldives, however, are a critical resting point for many migratory species like sea turtles. Unfortunately, most encounters with this vulnerable sea turtle are under stressful conditions and a large portion are found entangled in discarded fishing nets. Entanglement often leads to severe injuries and flipper amputations are common. In addition, stress experienced by turtles during this ordeal leads to buoyancy problems, which means they cannot dive. Since 2011, 65 olive ridleys have been found trapped in fishing nets. Many suffer severe injuries such as amputations and deep lacerations. Often rehabilitation back into the wild is extremely difficult and many do not survive. In the short time the Olive Ridley Project has been running, 21 olive ridley turtles have been found injured by ghost nets. It is difficult to say for certain where these nets originate and changes in current direction during monsoons add to the complexity in determining where drifting nets come from. In order to combat this problem, the ORP is aiming to actively target the origin of ghost nets using information gathered from the community. In order for this project to be successful, they need information from everyone who finds nets while conducting research or diving in the Indian Ocean or a net that has washed ashore on a beach near the Indian Ocean. A simple picture with exact location found would be enough data for them to use, but if measurements can be taken that would be even better.